Angstrom Advanced sets the standard in Ellipsometry-bringing the best in ellipsometry technology at the most affordable prices. Angstrom Advanced offers full range of ellipsometers for thin film thickness measurements, optical characterization for refractive index and extinction coefficient analysis (n & k). Our ellipsometers can be used for many different applications and are used in some of the most prestigious laboratories such as MIT, NASA, UC Berkeley, Yale University, Duke University, NIST and many more. Model PhE101S is an ideal instrument for antireflective coatings on Silicon Solar Cells. 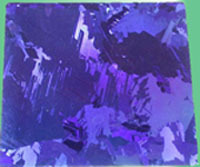 The thickness and optical constants of solar cell or any other antireflective coating’s measurement need unique and advanced technique and configuration because the antireflective coatings, such as Solar Cell has extremely rough surface with very strong absorption. The PhE101S has patented Minsearch technique-which stops the motor at a defined position before the intensity value is measured from the detector. This principle has a significant advantage compared to a system with permanently rotating analyzer because you know the exact rotation position for the measured intensity value. The ellipsometer with minsearch algorithms first searches for the orientation with minimum intensity. It does this by measuring intensities for three different orientation and calculating the orientation for minimum intensity. Then it measures again and again at three different orientations symetrically to the minimum until the minimum is found with reproducibility of 0.001°. After finding the minimum orientation the system meeasures the minimum and maximum intensity values and calculates the ellipsometric values. This minsearch algorithm is very similar to the measurement algorithm of a null ellipsometer, but is much faster and avoids compensator errors. Before measuring the minimum and the maximum intensities the step motor stops and the detector is adapted to existing intensity. The detector of the Minsearch ellipsometer has a dynamic range of 1: 400000000 which is much better than the dynamic range of a typical rotating analysis ellipsometer (normally in the order between 1: 4095 or 1:65535). Compared to an spectroscopic ellipsometer with CCD-detector which has a dynamic range of the detector of about 1: 512; the dynamic range of the Minsearch ellipsometer is better by a factor of 780 000. A high dynamic range is required to measure thin film correctly. Compared to a CCD-detector the Minsearch Algorithmus has the advantage that there is no blooming. The PhE101S is a high speed discrete wavelength ellipsometer designed for measuring the refractive index and thickness of single and multi-layer films with up to 9 layers. The PhE101S takes quick and accurate readings due to its precision optical analyzer/detector and its stable mechanical design. The ellipsometer is supplied complete with an integrated Windows software package, which further enhances the speed and ease of use of the instrument. The wavelength of the PhE101S can be selected from 543nm,594nm,612nm, 633 nm to 1150 nm. (The standard wavelength is HeNe laser at 632.8 nm). Infrared sources at 0.83, 1.31 and 1.52mm are also available. The PhE101S is very easy to use and can be fitted with our new laser alignment tool, which greatly improves the ease of use and speed of operation when compared to conventional ellipsometers. The PhE101S has 3 measurement modes that are based on harmonic analyses and one measurement mode based on minimum search. This minimum search mode gives correct results for very thin layers, which is normally not possible with rotating analyzer ellipsometers.Angstrom-Advanced received the Schmidt-Roemhild Technology Award for minimum search technology. Ellipsometric measurements can be carried out on sample areas smaller than 50 mm × 50 mm. Sample areas with small lateral dimensions can be analyzed using the micro spot option together with a mapping option. In ellipsometery it's important that the beam is accurately aligned with the sample. In order to make this alignment much quicker and easier for the operator, the PhE101S has an integrated laser alignment tool. This effectively removes operator errors resulting from incorrect or non-alignment of the sample. The software can be set to prompt the operator when alignment is needed. For Mapping the auto align option automatically corrects sample topography and bow of wafers. It detects the deviation of the sample surface from its best highest position and automatically corrects the tilt. 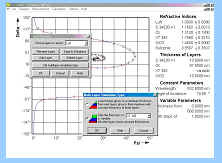 The PhE101S Research Ellipsometer software is prepared for a model and film library with predetermined measurement parameters; allowing the operator to select an application and quickly execute a measurement. The film library with films stack of up to 9 layers can easily be extended to include user defined film structures. For presentation of simulation curves there are two possibilities. First only one layer of the multi-layer system is shown and second the complete multi-layer system is shown as simulation curve. Simulation graphics can simply be stored in the WMF-format and loaded by text processing programs. Additional to this simulation data itself can be stored in an ASCII-file for data exchange.